A smoky sunrise at the NWS office in Chanhassen due to smoke filtering in overhead from wildfires across western Canada. Smoke from massive wildfires burning in western Canada will cause hazy skies across Minnesota Thursday and Friday. An air quality alert for portions of northwest and north-central Minnesota will expire at 10 a.m. Thursday, but conditions in those areas will still be moderately unhealthy for at-risk individuals. "Although general public is not likely to be affected at this AQI (air quality index) range, people with lung disease, older adults and children are at a greater risk from exposure to ozone, whereas persons with heart and lung disease, older adults and children are at greater risk from the presence of particles in the air." Areas shaded in orange will have the worst air quality on Thursday. "We&apos;ll be keeping an eye on the smoke to the north as it moves toward the Twin Cities into southern Minnesota Thursday afternoon," says the Minnesota Pollution Control Agency. 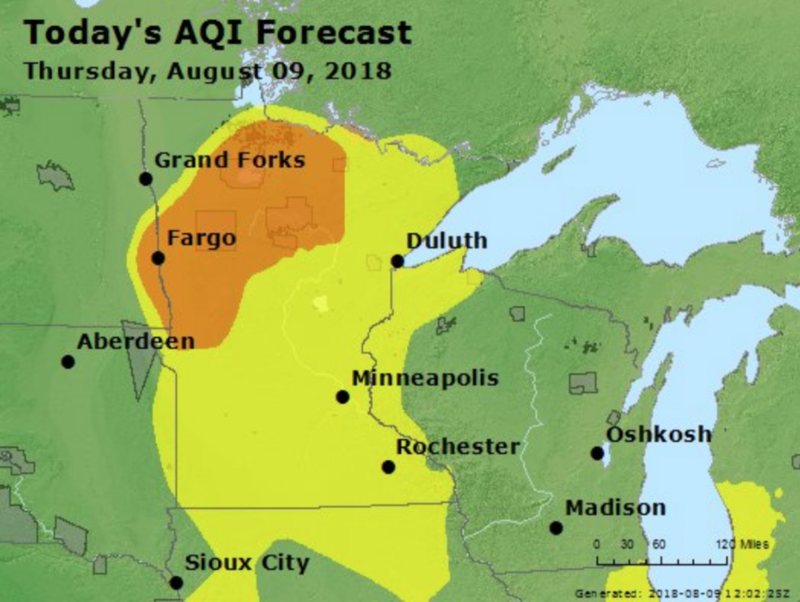 "At this point, AQIs are expected to be yellow from the Twin Cities into southern Minnesota Thursday due to the smoke with a few higher readings possible." Smoke could linger, causing hazy skies throughout Minnesota on Friday and Saturday as well. Smoke from Canadian wildfires blankets Minn.